Parks of the World features parks and park programs from around the world, showcasing significant parks and best practices in a monthly feature in the World Urban Parks e-newsletter World Park News. With an extensive network of parks, rivers and streams spanning from the freshwater Travis Wetlands to the undulating reserves of the Port Hills, Christchurch and its prolific green space has justly earned the title of ‘the Garden City’. Even with over 1,000 parks to share among the 375,000 residents, there is one that stands out as iconic in culture, history and size – Hagley Park and the Christchurch Botanic Gardens. The lungs of Christchurch, Hagley Park stretches over 165 hectares (400 acres). In pre-European times, Māori would camp and fish around the swampy plain that was to be converted into park land by early European settlers. Officially named in 1855, Hagley Park is bordered by the Avon/Otakaro River and adjacent to the cultural precinct, which is rejuvenating after the devastating earthquakes of 2010 and 2011. This district houses museums, heritage architecture, galleries and eateries. Those looking for a break from the bustle of city life will find that the sights, smells and sounds of modernity melt away amid the 3,000 trees and numerous wide open spaces. If Hagley Park is the city’s lungs then the Botanic Gardens is the heart. The tranquil atmosphere combined with an overflow of colour, texture, form, and scent pumps life into all who pass through the gates. In 1863 the Gardens started with the planting of a single oak tree and now includes 21 hectares (52 acres) of native and exotic collections, a formal rose garden, a pinetum, herbaceous borders, rock gardens and conservatories. Each season transforms the Botanic Gardens; spring drifts of daffodils and bluebells, summer blooms of fragrant roses, autumn piles of crispy golden leaves, and winter mists alluring and mysterious. As the great heart of the city, Hagley Park and the Botanic Gardens receive a combined visitor total of over 1.5 million annually and both venues are host to a diverse range of events including circuses, plays, cultural festivals and community days. International sporting tournaments are often held in the Hagley Oval cricket ground and the park’s sports facilities and shared use walkways are popular with residents and local schools. Occupying a unique space in both the heart of the city and its residents, Hagley Park and the Botanic Gardens have become intrinsically linked to the city’s growth and identity. Inaugurated in December 2012, Eco Park in Kolkata spans 480 acres, featuring a 104-acre lake with the 7-acre island of Sabuj Sathi in the middle. Eco Park was constructed to connect the residents of Kolkata’s New Town with nature and provide a place for them to come together with their wider communities. The park offers many activities such as land and water zorbing, boat rides, archery, cultural events and even a gaming zone, also making it a notable visitor attraction with over 750,000 visitors since construction. Eco Park includes a wide variety of themed gardens, including mist gardens, rose gardens, a mask garden, tropical tree gardens, wild flower meadows, formal gardens, a bamboo garden, fruit garden and a tea garden. The Gateway Arch is an international icon, and Saint Louis’ calling card to the world. It’s how people identify the city and dominates the skyline. Completed in 1965, civic leaders pushed for improvements to the surrounding urban National Park following the 50th anniversary of its completion, leading to the CityArchRiver Project, set to be completed by the end of 2017. The CityArchRiver project is made up of many partners and many components brought together to reinvigorate the downtown landmark and surrounding area. Seven key partners came together, the National Park Service, Missouri Department of Transportation, the City of Saint Louis, the CityArchRiver Foundation, Great Rivers Greenway, Bi-State Development and the Jefferson National Parks Association, to renovate several vital components including the tear down of a parking garage to create 7.5 acres of new park. A land bridge was created over an interstate highway in order to physically connect the Arch to Saint Louis. A new and improved riverfront area was created, where flood risk was reduced by 67 per cent by raising the street level. The project also resulted in a new and improved city park, and renovation of the Old Courthouse – a historic landmark in the region – and renovation of the 100,000-square foot museum, adding another 46,000 square feet and improving the visitor experience. Ferry Meadows Country Park is at the heart of the 700 hectare Nene Park in Peterborough in the UK. Visitors to the Park can enjoy extensive lakes, woodland, and meadow areas with a wide range of recreation activities as well as initiatives supporting conservation outcomes. Outdoor recreation activities range from a boat trip, bird watching, cycling, golf, fishing or a horse ride throughout the year. The park is supported by a visitor centre, cafes, and Nene Outdoors, which offers a wide range of water sport activities at Lakeside from sailing to windsurfing. Connected parkland includes a purpose built rowing lake and sculpture park. The large peri-urban park attracts about 1.1 million visits per year, has a number of events and a busy activity programme. Nene Park Trust is a registered charity and was established in 1988. Along with a 999-year lease on the Park, the Trust was endowed with commercial properties and other assets which now generate income to maintain the Park. Designed by Sir Joseph Paxton and opened in April 1847, Birkenhead Park was the first publicly funded park in the world. The creation of Birkenhead Park represented a significant stage in human development as a response to the poor health conditions brought on by the industrial revolution, creating a green oasis in an otherwise urban landscape. The concept was to create an idealised countryside landscape of open meadows, naturalistic woodland belts and beautiful lakes, which are shaped to appear as sinuous rivers with views across to iconic features such as the Roman Boathouse and Swiss Bridge. Big Break Regional Shoreline is one of the newest and most popular parks of the East Bay Regional Park District. Located in the rural community of Oakley, Big Break lies near the confluence of California’s two greatest rivers, the Sacramento and San Joaquin. The centrepiece of the 1,648-acre park is the Big Break Visitor Centre at the Delta, an educational facility with exhibits on the Delta history, agriculture, water, ecology and wildlife. A 1,200-square-foot interactive map shows visitors how water flows through the region, giving an overview of the importance of the Delta in California’s history and ecology. The mix of fresh and salt water creates an “edge effect,” with abundant habitats and species diversity. More than 70 species of birds frequent Big Break, along with 27 special-status wildlife species including the western pond turtle, river otter and beaver. Central Memorial Park, in the centre of Calgary’s downtown, was designed in 1911 as an elaborate representation of the lush Victorian-era parks of the time. It is one of a few parks in North America with a Carnegie Library and associated landscape both intact, and is Calgary’s oldest park. By the early 2000s, the park had fallen into disrepair. The challenge of the restoration project was to preserve the rich history of the site, while still addressing the contemporary needs of the inner-city neighbourhood. Chuck Brown Memorial Park, Washington, D.C. This month's park is shared by a new member: D.C. Department of Parks and Recreation. The Chuck Brown Memorial Park is located in Northeast, Washington, D.C. and honors the memory of Chuck Brown – one of D.C.’s phenomenal music legends. The memorial pays homage to Brown with a curved, inscribed memorial wall at the entrance of the park, where visitors can learn more about his legacy. An abstract sculpture signifies the “call and response” associated with the go-go music that Brown pioneered. Read more: Chuck Brown Memorial Park, Washington, D.C. The 135 hectare Rivierenhof was the first public provincial park in Belgium. Its origins reach back into the 16th century, when it was a private country domain. In the following years it had several owners, including a well-known local family of bankers, who owned it from 1776 to 1920, whilst the preceding owners were Jesuits (they held it from 1618 to 1773). The province of Antwerp purchased Rivierenhof in 1921 to protect it from a housing development project, and turned it into a public park in 1923, which is still its current purpose. Millennium Park in Chicago, Illinois, is introduced below from the perspective of the Millennium Park Quadruple Net Value Report (2011), produced by Texas A&M University and DePaul University. The report assessed the significant social/cultural, economic, environmental, and sensory return on investment of the park to the City of Chicago. The park, which is a former rail yard, parking lot and strip of green space, was conceptualised by former Mayor Richard M. Daley as an asset that would transform Chicago; one that would encompass art, music, and public space, becoming the world’s largest green roof (over a parking garage). The $USD 490 million park of 24.5 acres was designed by Frank Gehry, funded half by the city and half by private donors, and opened in 2004. The park now comprises a series of pavilions, one fronting a great lawn; promenades, outdoor galleries, and distinctive gardens, fountain, monument, cloud gate and serpentine bridge connecting 319 acre Grant Park. It is located beside the Art Institute of Chicago and Tourism, Visitor Information and Cultural Centres and contains a theatre for music and dance, restaurant and a Cycle Centre. The report describes Millennium Park as an example of real estate value creation through proper conceptualization, design, delivery and management in creating a cultural centre of Chicago, with 5 million visits per year, and an internationally recognized symbol of the city. The Royal National City Park is situated partly in the communities of Stockholm, Solna and Lidingö. The park was founded in 1995, and offers a unique mixture of nature and culture. Because it is located right in the middle of the metropolitan area of Stockholm it is extremely valuable for the recreation opportunities it offers to thousands of city residents. This item offers some facts about this fascinating park, as well as a brief history. Albert Park is one of Melbourne’s iconic parks. It is located about three kilometres from the Melbourne CBD and is some 225 hectares in area comprising notable sporting grounds, stadia, a golf course and a series of structured and unstructured recreation areas around a centrally located lake. Albert Park is one of the most popular parks in Victoria, receiving over six million visits per year and performing a critical role both regionally and locally as a destination for formal and informal recreation. While the park serves a critical local role, it is also an important regional destination forming part of a suite of major open space areas, informally known as ‘green lungs’ that encircle central Melbourne. The Parc de la Tête d’Or in Lyon is one of the largest urban parks in France. It was designed by the Bühler brothers in 1857 along the lines of an English country garden. Located in the north of the city of Lyon beside the River Rhône, it covers an area of 105 hectares (260 acres). It can be thought of as the lungs of the city, with its vegetation, zoological gardens and lake of 16 hectares (40 acres). The extensive areas of grass alternate with woodland, and many of the trees are more than 150 years old. The borders of the paths and flower beds, with their roses and peonies, bring touches of scent and colour in all seasons. Silesia Park (Park Śląski) in Chorzów, Poland was created in the 1950s as an initiative to restore an industrially devastated piece of land in the middle of three cities — Siemianowice Śląskie, Chorzów and Katowice. It is spread over an area of 620 hectares, making it one of the biggest parks in Europe, with forested areas covering 250 hectares and 100 hectares of tended green space and parklands. Park Śląski includes ponds, streams, numerous species of trees and shrubs as well as extensive gardens forming a refuge for wild animals living in the area in the vicinity of the Silesian Zoological Gardens, which include a walk with full-scale model dinosaurs. The park has diverse attractions, including an amusement park, a water park, a rose garden, an outdoor ethnographic park, planetarium, high ropes course, sports courts and cycling paths. Chapultepec Park, more commonly called the "Bosque de Chapultepec" (Chapultepec Forest), is one of the largest city parks in the Western Hemisphere, measuring in total just over 686 hectares and functioning as an ecological space in the vast megalopolis of Mexico City. The park includes Chapultepec Castle, a zoo, the Museum of Anthropology and eight other museums, amusement parks, winding paths, commemorative sculptures, lakes and fountains. It has been a retreat for Aztec rulers as well as a residence of Mexican heads of state, but today it is a favourite recreation place for families and receives over 10 million visits per year. Parque del Agua is a relatively new park, created in 2008 as part of the International Expo in Zaragoza that focused on water and sustainable development. Built on unused land bordered by canals, Parque Del Agua has rejuvenated the area and now boasts a number of recreational opportunities. At 120 hectares (nearly 300 acres), it is one of the largest parks in Spain. In keeping with the water and sustainability theme of the event, the park was designed with a multitude of aquatic features, with water from the Rio Ebro circulating through various features before returning to the river. Seven years after the conclusion of the Expo, Parque del Agua continues to be a draw for tourists and locals alike, hosting more than 1.5 million visitors per year. Constructed in 1984 to honour Princess Grace of Monaco (formerly actress Grace Kelly) after her tragic death, the Princess Grace Rose Garden was refurbished and enlarged by 1.5 square kilometres for its 30th anniversary in 2014. This garden was one of the first ecologically designed gardens in Monaco, including a special system to collect and utilise stored rainwater. 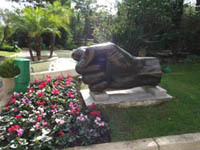 It also features a sculpture walk, including Cavalleria Eroica by Arman, The Fist by César Baldaccini, and H.S.H Princess Grace of Monaco by Kees Verkade. Also known as the Miracle Planet Museum of Plants, the Kiseki no Hoshi greenhouse is based in Yumebutai on Awaji Island - the 'island of flowers'. Created in the year 2000 as a functioning greenhouse and 'botanical museum', it sustains many different varieties of plants. It has an arid garden, a tropical garden, a healing garden, an open-air rose garden, and a 'lifestyle' garden that re-interprets traditional Japanese gardens on modern terms. The Yumebutai complex was an ecological response initiated to regenerate an area scarred by large-scale soil removal used for land reclamation in Osaka. Nearby features include 'Hyakudanen', the hundred-step garden which features a geometric network of 100 stepped flowerbeds linked by an intricate maze of stairways. The Botanical Garden of Buenos Aires was created in 1892 and opened to the public in 1898. It is the most 'untouched' of the green spaces in the city of Buenos Aires, and retains its original design by French Landscape Architect Carlos (Charles) Thays as well as a large number of the originally planted species. Trees are the highlight of the garden, which also features fantastic collections of cacti, cycads and palms. With an area of 20 acres in the heart of the city, it is a real treasure for the citizens. Over the last five years, its activity has evolved towards education and research on biodiversity and the Garden is a leader among similar institutions in the country. Centennial Parklands consists of three adjoining major urban parks - Centennial Park, Moore Park and Queens Park. Covering 360 hectares, the Parklands is the birthplace of modern Australia, hosting the Inauguration of Australian Federation ceremony in 1901. It is Australia's largest community sports destination, providing indoor and outdoor spaces for events that attract over 600,000 patrons a year. The Parklands has been awarded three consecutive Green Flag Awards, and was recently recognised with a national Facilities Management Award for its technological innovations in infrastructure and open space management. Classified as a Garden of National Significance by the Royal New Zealand Institute of Horticulture, Otari Native Botanic Garden and Wilton's Bush Reserve is the only public botanic garden in New Zealand dedicated solely to native plants. Otari is a unique plant sanctuary and forest reserve, spanning 100 hectares of native forest and 5 hectares of plant collections. Some of Wellington's oldest trees are here, including an 800-year-old Rimu tree. We're starting a regular segment showcasing parks and park programmes throughout the world. This month features Green Hearts Park Walks in Helsinki, Finland - a website designed to assist residents and visitors in discovering the city’s many delightful parks with the help of historic stories and planned walks.